Monitor multiple children or rooms with the Dual View system. Featuring two pan/scan/zoom cameras with two-way communication, and a large 3.5” color handheld video monitor with innovative split-screen technology, parents can view 1-2-3 or 4 rooms at one time on the screen, day and night. 100% digital technology for privacy and security, with a range up to 600-feet. 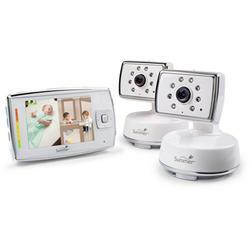 Expandable system – add cameras to monitor multiple children or rooms, up to 4 total (extra cameras sold separately, item #29010) with split-screen or video and audio auto-scan between rooms. 3.5” high resolution color LCD video display, with black and white night vision. and low battery and out of range indicators.